Tracy: I am all for physical fitness for kids (and adults)! The Marathonkids program sounds like a fabulous idea! Hopefully, some of you teachers out there can get your school systems to give it a try in your area. Melisse: What better time than the lazy days of summer to learn about ocean life. Take a look at this link... With so many facts and photos, it will occupy your kids for hours and it is educational! Jim: This is a home decorating link, but I like it because the couple who write the blog are in Richmond. Neat inexpensive ideas presented in a young fresh manner. While the long days and weather can be challenging, we have a great time working with the kids. Cathrine does silly dances, we tell jokes and do whatever we can to make it fun for the models. You get to see the final results of our hard work in the catalog and on the web, but we capture alot of funny moments too. We thought we'd share some of those with you! Cole gets caught jumping on the bed! 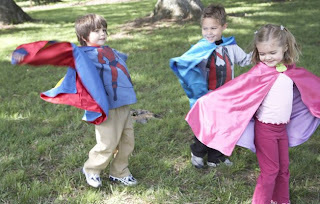 Give a child a cape and their imagination goes wild! Something for girls... something for boys! Both a great deal! Glitter Flip Flop Available in three colors... lots of sizes still in stock! Was $20.00 - Now only $7.00! I think I am the newest employee at CWDkids-- and one of the oldest!. How can that be? Nearly 20 years ago, my father started CWDkids. At its start, CWDkids was a very small operation. On my vacations from college, I was the “customer service department” and answered phone calls while my mother was in her sneakers filling orders in the warehouse, my aunt wrote the copy for the catalogue, and my grandmother “left” catalogues all over town. When your family runs a small business, every member of the family is involved. I received my business degree from the College of William and Mary and have worked in the marketing research departments of three large corporations. Fourteen years ago, I retired from the working world when I had my first child, Will. Since then, I have had two more children, Nathalie and Bennett, so I know first hand the very busy life of a stay at home mom. Last fall, my brother, Jim, who now runs CWDkids, asked me if I would like to work a few hours from home helping to expand CWDkids’ internet marketing efforts. Since my three children are now in school full time, I thought it would be a good time to put my toe back in to the working world. It has been great so far. I love setting my own hours and being able to work at home. I have become one of the many faithful blog readers across the country. My children laugh because I am always trying out the great ideas, recipes, and fashion ideas that I find on the terrific blogs that I read on a daily basis. 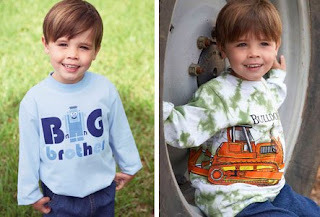 My children were some of the catalogue's first models and its best customers. My ten year old daughter Nathalie has taken to the fashion business. She loves giving her opinion on which outfits she likes and absolutely adores “shopping” at CWDkids with her Uncle Jim. - I consider Oliver, my King Charles Spaniel, to be my “fourth” child. - I am a magazineaholic! I love to read Real Simple and O magazines. - My favorite dessert is peanut butter ice cream with M&Ms on top. While our staff can agree that CWDkids offers a great selection of unique styles from terrific brands, we all have our personal favorites. So we are starting a set of posts for the blog showcasing different staff members favorite choices for Fall. Let us know what you think of their picks! I absolutely love the Floral Wrap Tunic with aqua Lace Hem Leggings from Mulberribush! I also love the lime jacket (K722) and flower skirt (K724) from k.c.parker for myself! But if I were shopping for my niece, Madison, I KNOW she would LOVE the Cat Tee and Zebra Print Tiered Skirt. She’s a huge animal fan and loves pink! For my nephews, Deegan and Cooper, the Star Wars Double Sleeve Tees would be a huge hit! Plus, my sister could cut the double sleeves out when the weather turns cooler! Is July really National Ice Cream Month? I hope so because I am planning on celebrating my love of ice cream all month long (or at least the week that is left)! I will take any excuse I can find. I found some great recipes that I know your family will love. 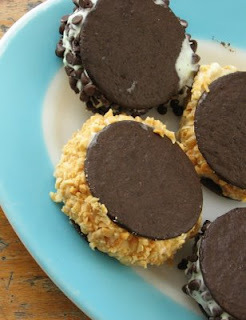 On the Plum Pudding blog, I found these delicious ice cream sandwiches. This recipe is SO easy that your kids can make them! I also found this yummy looking ice cream pop that has a surprise inside. Your kids will love them. Click here to find the recipe and what the secret ingredient is…. Ashley: I am getting my children ready for school! You may think I am crazy or very organized… I am neither of the two; however, I found this great idea on the eensies blog about what to do with all of your children’s art and school work. Over the next few weeks, I am on a mission to pare down my collections of artwork so I am prepared for all of the paperwork that is coming in August! Believe it or not, the start of school is just around the corner. Tracy: I don't normally do this, but after I saw Ashley's link for the week, I have to pitch our own website! I just cannot help myself because we are carrying a really fun line this year. Check out our Ed Hardy backpacks. They will surely get your kids excited to head back to class! Jim: A reminder about back to school shopping. Tax free weekends are on the horizon all over the country. Here in Virginia, shop tax free for school clothing August 7-9, 2009. And remember, all CWDkids.com purchases are tax free for other states all year long! This adorable 4-year-old won our hearts immediately and made it on the cover of our second fall catalog with his hilarious expression! 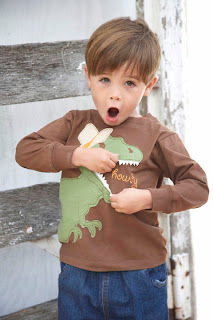 He thought this dinosaur tee was so cool; he grabbed its teeth and said "Roar!" Quade was also super excited to wear our "Big Brother Tee" as he recently became one. Quade is a big fan of "Finding Nemo." Want what Quade is wearing? Click here to shop our Howdy Tee. Click here to shop our Big Brother Tee. Click here to shop our Bulldozer Tee. Wednesday - Deal of the Day! Must Have for Fall: Think Pink! What is the newest trend for girls this fall?? Think PINK! Pink is THE color of the season for girls. Take a look at this adorable outfit and you will see what you have to look forward to: lots of hot pink and stripes! This fall, one of our favorite brands, Mulberribush, has designed this outfit. You can dress it up or down, change the shirt, change the tights or headband. This will definitely be your child’s favorite outfit! Click here to find out more about this must-have for fall. Update: Mary Martha has been busy at work and at home! She helped to oversee construction during the expansion of our Gayton Crossing Store in Richmond, VA. Now we have our outlet and current merchandise all in one location. Everybody, customers and employees alike, are very happy with the consolidation. Come visit if you are in the area! As is expected with a first grandchild, she is using her vacation time to travel to Georgia. Her grandson is on the verge of walking... it is amazing how much happens in a short period of time! She is so glad he can wear our infant clothes now (even if her pocketbook is not) She says that he is "cute as a button" and we agree. Check out the photo she has shared with us. 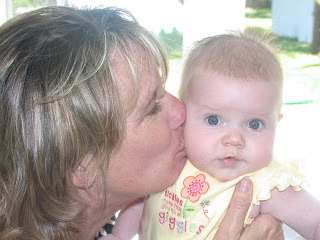 Staff Profile #16 - Mary Martha (with CWDkids since 1997) Word of mouth...it is definitely the best advertising! Not only does most of our store traffic come from friends telling friends about us, it also helped me land a job with CWDkids! I had worked for a small specialty store for 12 years when I heard from a friend that CWDkids was looking for a manager for their new Gayton Crossing Outlet store in Richmond, VA. She had heard about the opening from a friend of hers that worked for CWDkids...sounds like a case of telephone, but luckily nothing was lost in translation and I was the lucky person to be hired for the position. I have been managing our Gayton Crossing Outlet since 1997 and through the years have added several additional responsibilities to my plate. I am the District Manager for our three Richmond retail locations, I purchase non-catalog merchandise for the stores, I am the official event planner for company outings and activities, and many other little (but important) duties. Plan, plan, plan is my motto... I can't stop event planning with work parties so in my spare time, I also plan birthday parties and weddings. When I do not have anything else on the calendar, I make diaper cakes for friends and to sell. I also plan outings for a group of girls (we call ourselves YAYAs) about once a month. 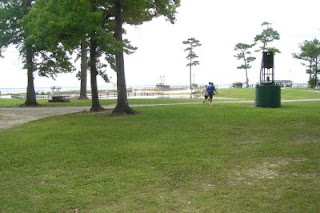 We have done everything from river fishing trips and week long beach vacations to cookouts and movie nights! Over my 20 some years in the children's retail field, I have collected outfits, both boy and girl in all sizes, to add to my "HOPE CLOSET" in anticipation of having a grandchild someday. This past August 10th that closet was raided for my first grandchild, Logan Andrew. Needless to say, my vacation time hence forth will be primarily used for visiting him in Georgia and my paycheck will be going back into the company as I now have someone to help dress. I love to fish... deep sea or bottom fishing, and would definitely like to learn to flyfish. I do not even mind cleaning and cooking them to eat. I love to make something out of nothing... materially that is. Decorate everyday plastic cups to make them special for any occasion, make handmade note cards, decorate a simple tee shirt with old buttons, etc. My body sleeps, but my mind won't! Melisse: I was visiting Disney Family.com and thought you'd enjoy this in the midst of the summer heat. 10 Fun Outdoor Games for Kids Enjoy! Tracy: My 2 year old is obviously taking after my husband. He is the chef in our house, and she LOVES to watch and help him in the kitchen. And, while she will not sit still to watch the usual kids shows, she has started to watch the Food Network with us. 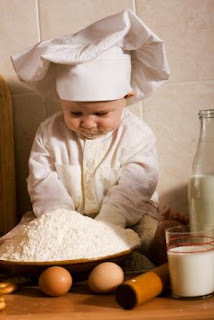 So I thought that I would share this link with tips on cooking with your kids. Cathy: I passed a lemonade stand in our neighborhood this past weekend and it brought back some memories from my childhood. Then I ran across this blog post by The Sugar Mommas at Modernmom.com. Hopefully, it will inspire you to set a stand up with your own kids... or at least patronize a neighborhood "business". How To Survive Your Summer Road Trip! In a few weeks, my family will be hitting the road to Yellowstone National Park. My husband and I will be spending one week driving on America’s highways with our three children. This will be our first real family road trip! I am really looking forward to seeing a new part of the country, but I am a little nervous as traveling with children can often be challenging. Luckily, I am past the baby bottles and diaper stage; however, I do have a 13 year old. I am not sure which is worse, an inconsolable screaming baby or an irrational 13 year old. Truly, it is a toss up. I have been looking all over to find the best way to pack our things and tips on how to entertain our kids on the long car rides that we will have from place to place. 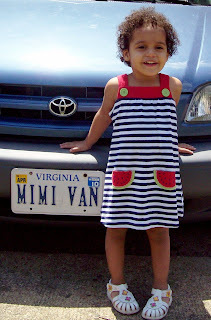 I found some ways to fight boredom on car trips on mommy’s idea book blog and on uptake.com. 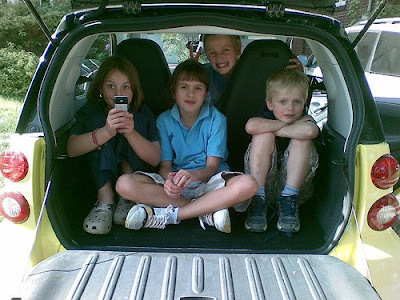 Take a look here and here to find great games and activities for your kids to do in the car. I know my children will particularly like hooking up the family mp3 player and playing “Name That Tune”! I am also going to use the “kids essentials check list for a road” put together by Real Simple. 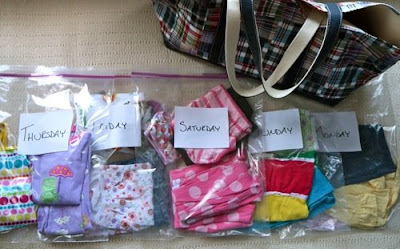 To pack, I love the suggestion that I found on the small notebook blog to pack each day’s clothing in individual Ziploc bags. This will make it easy for my kids to find their clothes and will keep them from destroying the contents of their suitcases when looking for something to wear. It will also help my 7 year old wear clean clothes every day that also match! If you have any great ideas, please let me know! Get these best-selling dresses from Anita G.
Available in 4 patterns for only $9! Pair them with leggings and she will be able to wear them well into Fall! For Boys, check out these athletic shorts from Puma. Available in 3 colors for $5 each! ***Offer expires Wednesday July 15th at 11:59PM est. Host A Summer Book Swap! Do you have trouble parting with your old books? My neighbor and I came up with a fun way to clear your bookshelves and a great excuse to have a party! We hosted a Summer Book Swap! We invited 25 of our friends and asked them to bring some of their favorite adult and children’s books to swap. We scheduled our party for a weekday evening and made appetizers and a YUMMY frozen mint limeade to serve. As our guest arrived, we arranged the books into categories: mommy beach reads, history, young girls’ fiction, children’s classics and so on. We had a great time recommending books to each other. It felt great to give some of my favorites away to friends and their children. We donated all of the unclaimed books to a local charity. It was a huge success! Somewhere between a child and a teen, you’ve now entered the “tween” zone! Almost as scary as the Twilight Zone (there I go dating myself again) are the years from age 10 to 12. Your child will morph into someone you may not recognize. 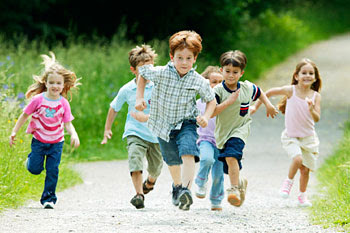 They will start to emulate their favorite sports, movie or musical personality. They will just “have to have” the newest and trendiest clothes. They may want to experiment with a new hairstyle or develop a new slang term daily. Just hold onto your seat and enjoy the ride. This (contrary to what you may hear) is a wonderfully adventurous time for you and your child. Your son or grandson now wants to wear tees with guitars, peace signs or sports instead of trucks, dinosaurs and planets. He may feel more “grown up” in Varsity Fleece Pants or Mesh Pants than cords or cargo pants. He may want to wear “what the other guys are wearing”. He is going to hit a major growth spurt, so let him wear what he wants. He’ll outgrow it before he wears it out! Buy elastic waist pants and shirts with athletic fits. Buy larger so you won’t be looking for long pants he’s outgrown when there’s nothing but shorts in the stores. Your daughter or granddaughter wants to look “grown up”. She may come to you with fashion magazines and say “I want that!” She definitely wants to wear what all the girls are wearing! You can find outfits that both of you will agree upon. Brands such as Polo, Puma, Plum Pudding and Flowers by Zoe have that “fashion forward” look, however she will still look her age. For girls, this is a harder age to try to fit. Some girls will “shoot up” and thin out where others will not. Some may develop a “bust” which may make fitting tops difficult. Luckily, this season seems to feature the flowing style of the 70’s. This is great for all sizes. Fabric that is cotton/spandex blend will give extra stretch. My sizing advice would be to order a size larger than their age, remembering there are no 9, 11, or 13 in girls sizing until they hit the teen size range. 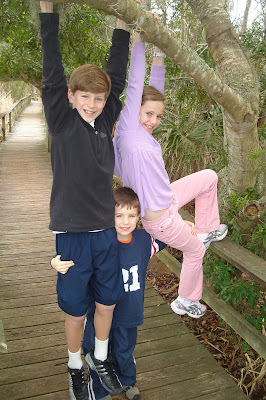 The best piece of advice I can give is just to relax and enjoy every moment of every stage of their childhood. Just remember, you’ll get to do it all over again when you become a grandparent!! Tell Us Which New Pattern Is Your Favorite! We have some terrific new patterns in our best selling sleepwear. Take a look and tell us which is your favorite! Sara's Prints gowns, ruffle pj sets and long johns are inherently flame resistant. Our popular CWDkids brand pajamas have a snug fit for safety, but stretch for comfort. Whichever your preference, we think your kids will be delighted with the themes and colorful prints. Update! Since my last update, my granddaughter was born. She was due in January, but she decided she liked December better! Miss Madeleigh (Mad-a-leigh) Caroline was delivered on December 29th, with this proud grandmother in attendance! I can’t wait for the tea parties to begin!!! My youngest daughter, Kate and I have been volunteering at the Children’s Museum of Richmond this year. Kate belongs to the Youth Advisory Council and we work some of the museum benefits together. I’m lucky; she’s 13 and still doesn’t mind having her mom around! I still visit The Animal Rescue Site every day. Each visit provides a bowl of food to an animal in a shelter. I have been contributing sizing advice on our blog. 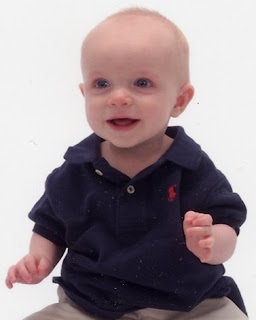 So far I’ve written about infants, toddler & 4-6x/7 sizes. Look for the last contribution tomorrow. It will be about “tween” sizing. When I was asked to write my profile for our blog, I immediately thought of the profile that was done on me in the CWDkids catalog in 1998. Melisse: Since it is vacation season, I thought I would share this great article with games to play on those long road trips. Might even keep the grown ups occupied! Jim: Another thing sure to keep the kids occupied in the car is keeping a stock of good books! Check out the ones suggested by the N.Y. Times. Ashley: We are almost half way through the summer and I am desperately looking for fun, different activities for my children that do NOT have to be plugged in! I just found some wonderful ideas on the Boomerang blog. You will find loads of ways to keep your family busy. You will even find a summer planner that you can print out to encourage your children to learn and still enjoy their summer vacation. Eventually, they wandered off. A while later, I realized I had not heard from them in some time and started looking to see what they were up to and saw this! They were having a blast. I heard giggling and looked up to see their creation, a “secret” fort. My three kids had created a clubhouse and were having spy meetings and devising plans for hours. Later that night, these same "bored" children set up a family Olympics, complete with a long jump, ping pong tournament, and racing time trial. My youngest son drew our prizes. See his handiwork below. I am always amazed at what kids can come up with once they are allowed to get bored and create fun on their own! I think this was one of their best days of summer and we did not leave the house! Get two of our best selling Junk Food tees for only $13! * Offer expires 11:59PM Wed. July 8. My oldest son is off at camp. For four weeks, he will be at a beautiful camp in North Carolina. To be able to sail, kayak, water ski... Okay, I must admit that I am a bit jealous. To satiate my desire to go back to camp, my younger two children and I are on a mission… to watch all of the great summer camp movies that we can find. Who does not love to watch the classic and new versions of The Parent Trap?? I found this great list of summer camp movies on Moviemom.com. I love this site. On it, you will find movie reviews written by parents. You can read about all of the latest movies and you can decide which movies are appropriate for your child to see. Let’s break out the popcorn! What are your favorite summer kid movies? Comment and let us know! I have an insider’s tip about my favorite boys’ bathing suit. I have two boys at home and have bought just about every boys’ bathing suit made. I also save my suits and pass them down from oldest son to youngest son. Many suits wear out and cannot be saved. I think Vineyard Vines makes the best quality boys' bathing suit around. This is my youngest son at the beach in his Vineyard Vines suit. He has worn it A LOT this summer. He has been in very chlorinated pools and the salty ocean. His suit still looks like brand new! Best of all, this suit is now on sale for $39.99. Take a look here and grab one before they are all gone. What do you think about the Vineyard Vines brand? Leave us a comment and let us know! Update! Since writing this profile last year, a lot has changed. I've gone from Weekend Mimi to the primary care giver to five of my grandchildren. Home life these days is, well....busy. Although my youngest doesn't live with me, she calls me, If I don't see her each day. My son became a single father earlier this year and with five children this was no easy task. There were many decisions that had to be made. We concluded that moving in with my husband and I would be best. This is where I would like to brag about the companies we work for.. My son is an electrician for a family owned business, my husband is the facilities superintendent at a local up scale shopping center, and of course CWDkids is my home away from home. These outstanding businesses understand the needs of family. They've allowed my son and I to tweak hours, and my husband to take a vacation day every Friday during the summer to fill our needs and that of my grandchildren. We feel so blessed and want to take this opportunity to say thank you and let others know just how special you are! 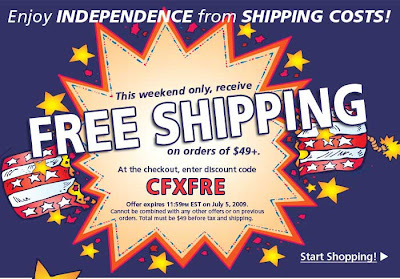 Freedom from Shipping - This Weekend Only! Order by 11:59PM on July 5 and receive FREE Standard Shipping on your order of $49 or more. Enter code CFXFRE at checkout to redeem this offer. Note: Cannot be combined with any other offer or on previous or pending orders. Merchandise total must exceed $49 before tax and shipping. This week we thought we would tie our Friday Faves links in with the holiday. We hope you all have a happy and safe Fourth of July. Take lots of pictures... we would love to see your kids in their favorite CWDkids' outfits! Post them to our Facebook Page by August 1 for a chance to win a gift certificate in our Kid of Summer contest! 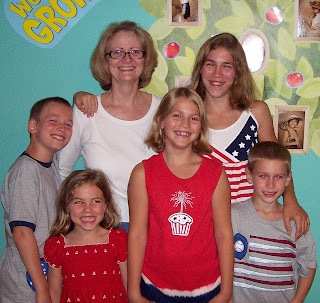 Ashley: We constantly get positive feedback from customers for our selection of Made in the USA kids clothing. So we were very excited to see CWDkids mentioned in this article on MSN Money with tips on how to buy American! Tracy: I ran across the Hotdogger Blog the other day and it gave me a good laugh. I am sure many of you will be grilling with your families this weekend. Check out the website with your kids. Who knows, maybe there is a weinermobile in your town now! Kara: What would your celebration be without fireworks? Here is a link to some fun facts about the Guiness World Records for fireworks and a link to the largest firework display in case the kids don't make it up for the real thing. Happy 4th! OK, so I am packing my hospital bag in preparation of the big day! 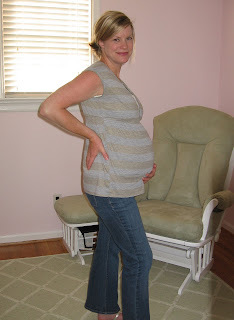 My due date is still 4 weeks away, but I'd rather have a few things ready because I know that I'll want my most comfy yoga pants and tank top and I can just picture my husband rummaging through my drawers without a clue as to which specific items I have requested!! Here's a checklist I have been working from. 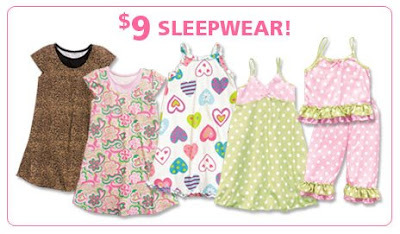 Today Only get adorable summer sleepwear for only $9.00* each!